The deep overhanging lintel above the doorway suggests that an ornamental railing once sat atop it. When the French-speaking congregation of L'Eglise Francaise du Saint Esprit erected its new edifice at No. 28-32 West 22nd Street in 1862, the neighborhood was one of high-stooped homes. Half a block to the east on Fifth Avenue, Mahattan's wealthiest citizens lived in enviable luxury. Another French language church, St. Vincent de Paul, erected in 1857, was only about a block and a half away at No. 123 West 23rd Street. But the upscale residential nature of the neighborhood would not last. By the end of the 19th century the millionaires of Fifth Avenue had moved further north, past 23rd Street, and stores and lofts invaded Sixth Avenue and the side streets. In 1900 L'Eglise Francaise du Saint Esprit began construction of a new church on East 27th Street. The church sold its 22nd Street site to real estate operator Ralph Riess who, in turn, resold it on March 9, 1900 to developer Louis Sachs. Sachs recognized the enormous potential of the plot, spending $265,000, or more than $8 million today. But then Sachs had to decide whether to build or sell. On December 21, 1901 the Record & Guide reported that his architects, Schickel & Ditmars, "are drawing plans for an 11-story mercantile building." But, it cautioned, "This plot is directly opposite Stern Bros.' store, and negotiations for its sale to that firm are still on. If they are consummated the building will not be erected." By the time a decision was made in 1904, Sachs had changed his mind. Instead of a single, massive loft building he would erect two--a wider one at Nos. 28-30 and another at No. 32. And although Schickel & Ditmars matched the two structures in height, they made little attempt at architectural similarity. A reserved, commercial take on the Beaux Arts style, No. 32 showed off not with swags and cartouches, but by overblown brackets and consoles. Next to the understated storefront, the entrance to the upper floors was embellished by paneled pilasters which sprouted elaborate brackets which rolled up like breaking waves. Rather than the expected leafy decoration, they wore stylized seashell designs. The molded cornice above the second floor was supported by elegant fluted consoles that terminated in rolling capitals. (The innovative capitals look rather like the severed ends of Ionic capitals turned to their sides.) They perched on formal paneled pedestals. The openings of the third through sixth floors sat on projecting stone sills supported by handsome brackets. The large central windows which admitted large amounts of northern light would prompt Sachs to market the spaces as "Studio Lofts." Above it all a confident metal cornice sat one stone consoles. Located steps from the retail emporiums of Sixth Avenue and 23rd Street, Sachs's tenants reflected the dry goods industry. 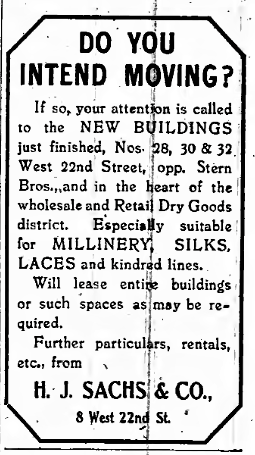 By 1906 Wellington-Pierce Lace Curtains was listed here, joined before long by firms like Rosen, Pletcher & Lipschultz, agents and importers of "velvets, velveteens and corduroys," and the Enterprise Button Co. In 1907 Sachs placed No. 32 on the market. The Record & Guide ran an article that year, on November 30, which remarked on the astounding rise in property values along the block. It said in part "About eighteen months ago property on this block was worth about $100,000 a lot, which was between $25,000 and $30,000 more than the prices obtained five years previous and $45,000 more than ten years ago." The article mentioned that Sachs was now asking $425,000 for his building. He found a buyer in September 1908 in Ida C. Bracher. She took out a sizable mortgage with the Seaman's Bank for Savings which presented problems for her six years later. Bracher's tenants one-by-one moved out and she had trouble filling the spaces. 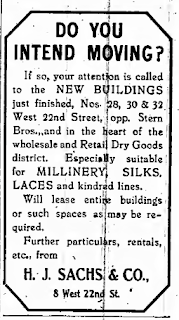 By April 1914, according to The Sun, "the entire building is vacant except the top floor and part of the fifth floor." The rent she collected could not meet the mortgage payments and the courts ordered the building sold in foreclosure auction. The new owner was far more successful in luring tenants. In 1915 the Paris Children's Dress Co. moved in, as did waist manufacturers Silverstein Brothers. (Waists, or shirtwaists, were the popular tailored blouses worn by women worldwide.) They were soon joined by apparel makers Maumet & Singer, "cloak and suit house" M. W. Cohen, and A. Jonas & Co. The makers of better garments stored inventories of costly fabrics as well as finished goods. Both were tempting targets for burglars. On November 28 crooks climbed to the roof of No. 32, broke into the hatch and slipped down the ladder. Once inside they went to work breaking through a wall. The Sun, two days later, reported "Some time during Friday night robbers cut a hole in the wall, entered the establishment of Silverman [sic] Bros. at 32 West Twenty-second street, and stole about $25,000 worth of silk." The robbery was just one of a string in the neighborhood. On December 9 the New-York Tribune ran a headline "Silk Robbers Get $500,000 In 3 Months." Most of the thefts took place in the immediate neighborhood of Silverstein Brothers. The $25,000 loss the firm suffered was devastating, totaling more than a third of a million dollars today. The following year Seligman & Latz signed a six-year lease for the store and basement. Described in directory listings as "hair goods," the partnership would grow into a large-scale operation. The firm's growth was evidenced in 1923 when it was seeking additional clerical help. One advertisement might cause some head-scratching today. "Comptometer operator with knowledge of typewriting; must have about three years' experience at comptometer work." 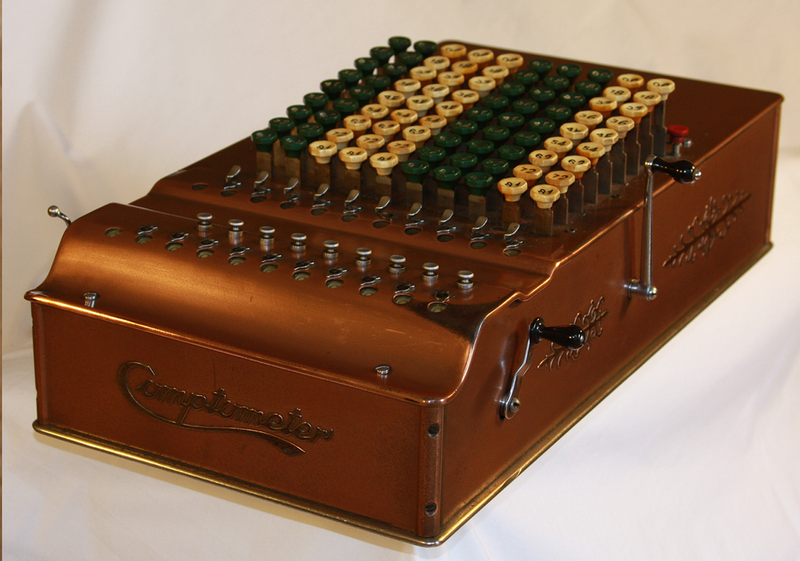 The comptometer was the first successful key-operated mechanical calculator. That Seligman & Latz required a sophisticated machine for its accounting hinted at the size of its operation. Wanted: Women, experienced, to manage high-class hairdressing shops; only those with thorough knowledge of the business need apply; permanent positions with an organization operating from coast to coast; good salaries and commission. Silverstein Brothers, having been in the building since 1915, declared bankruptcy in 1922. Its departure came about a decade before the tenant list within the building changed from mostly apparel to printing firms. Among the first was Empire Printing, which manufactured stationery products like Christmas cards. In September 1934 it advertised nationwide for local salespeople to sell "21 assorted Christmas cards, 25c, 35c, 50c, box." The advertisement assured potential employees, "Sells on sight." A less innocent publication was The Daily Raiding Tab, published by Tab Printing Company. On December 7, 1935 the Long Island Daily Press reported that the 36th Street offices had been raided by Federal investigators. The headline announced "Another Held as 'Tipster'" and the article began saying that managing editor James J. Davenport another man, Harry Cohen, had been arrested "in the campaign against racetrack tipsters." Three of Davenports associates had already been arrested for the crime. "Tipsters" published the odds of horses winning races, giving gamblers at the track an advantage. Investigator Harry Blevers, who led the raid, told reporters that the two men "were preparing to get out today's issue when they were arrested." There were still one hold-over from the dry goods days here. Rex Rayon & Thread Co., Inc. was here in 1940. Also in the building was Kwik Products, a rug dyeing operation. On September 8, 1941 the Shopping News informed readers that "Kwik Products Co., 32 West 22nd, will dye rugs expertly either on or off floors." The following year it noted that the firm "cleans and dyes rugs, leather; cleans smoke damage." On the night of January 21, 1942 fire broke out in Nos. 28-30, next door. Luckily employees in one of the printing firms here were working a night shift. They smelled smoke for some time before it became obvious that there was a fire. Their call to the fire department helped save the structure. Those men may have been employees of the Daily Sports Bulletin Co., headquartered in St. Louis. The periodical kept sports fans up to date on games, schedules and players. It was, apparently, on the up-and-up, unlike its predecessor. The owner of the parent company, William Molasky, was called to testify before the Senate hearings of the Special Committee to Investigate Organized Crime in Interstate Commerce in 1950. The 58-year-old mogul insisted "I have never engaged in bookmaking or in any commercial gambling. I have never had a financial interest in any gaming establishment; and my personal and business associates do not include bookmakers or professional gamblers. Even though a distribution of publications during my entire life, I cannot, to this date, interpret a racing form." The advent of television brought a new publication to No. 32 by 1952. 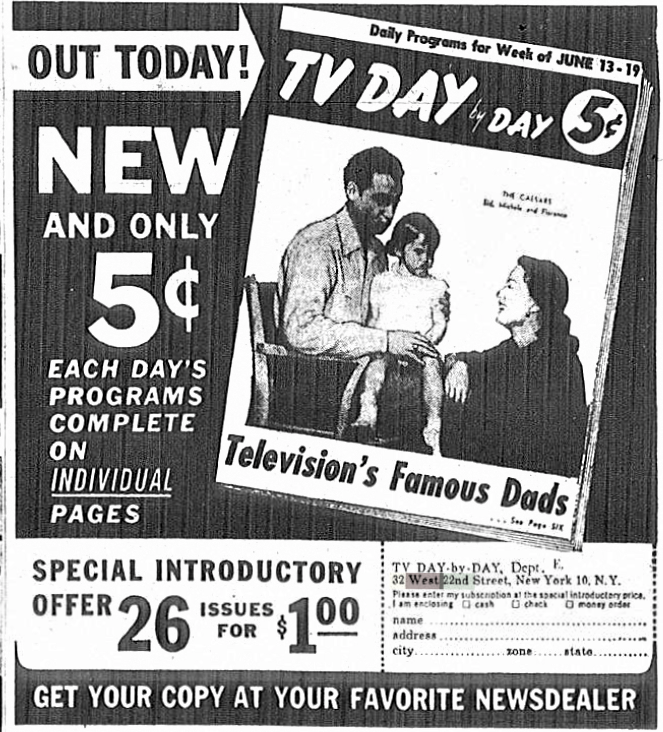 Like the TV Guide which swept a television-addicted America, TV Today offered articles about small screen stars, but most importantly listed what was playing and when. 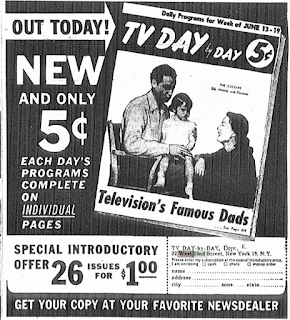 Decades before on-screen guides, the paper listings were invaluable to families watching from the couch. Among the periodicals published in the building during the 1960's were the humor magazines Army Fun, Army Laughs, Broadway Laughs, and Laff Time. In 1983 a renovation was completed which did away with the manufacturing spaces in the upper floors, converting them to offices. The handsome 1905 building is remarkably intact, drawing less attention than it deserves only because of the other striking structures around it.